All you can find on the web about sims 3 that you must see (and perhaps download)! Vi segnaliamo gli ultimi articoli disponibili sul The Sims 3 Store del mese di maggio e giugno! Il set Vita Nautica sarà perfetto per decorare la propria casa con questo stile nautico, inoltre il set sarà perfetto per realizzare delle case galleggianti a tema che saranno introdotte da The Sims 3 Isola da Sogno! Se invece siete stanchi del solito abbigliamento moderno, il set Moda della Fifth Avenue offre una vasta scelta di vestiti anni '60! During the last live chat a new Medieval-themed neighborhood was announced: it's called Dragon Valley and it's coming out soon! The official trailer was shown during the event, but not published by EA. Thanks SimsVIP for putting it on their channel! Neighborhood enthusiasts, take your calendar and draw a huuuge circle around February 21st: it's when you'll be able to purchase a new world, Aurora Skies! Explore the breathtaking scenery and vast, unspoiled nature that await you at Aurora Skies! This quaint, coastal town features the very best in outdoor living: grow your family on spacious land and houses surrounded by an eco-friendly community, traipse under majestic, towering waterfalls that come to rest on the banks of a large, steaming geothermal lake sky, or take a night hike under the dome of the bright, multi-colored sky. It's the ultimate getaway for Sims searching for change, searching for themselves, or searching for a piece of peace. What will you find at Aurora Skies? Soo, yesterday Maxis hosted the live chat about The Sims 3 and SimCity 5, where they announced A LOT of new things! Unfortunately, I couldn't watch the event live due to my job, so I'm going to share the news with you all now! First off, in order to stick to the point of the latest updates, I'm glad to tell you that a new neighborhood has been announced! 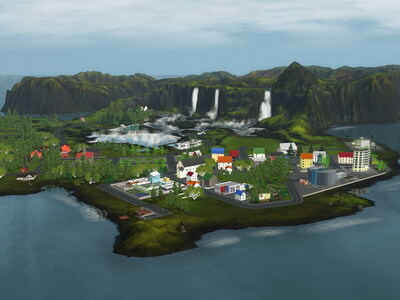 It's called Monte Vista and will be available on the Sims 3 Store very soon! It looks really nice and kinda resambles Tuscany/Italian villages, or at least so it looks from the pictures shown during the event. SimCookie has extracted a few screenshots of the town! Stay tuned for any new detail!